Summary and Definition: The Ballinger-Pinchot Scandal erupted in November 1909. The scandal involved Richard Ballinger, the Secretary of the Interior, and the Progressive conservationist Gifford Pinchot, the head of the forestry division in the Department of Agriculture. The scandal centered on Richard Ballinger who was accused of conspiring to defraud the public domain in the Alaskan coal fields and that the Taft administration was complicit in his actions. The Ballinger-Pinchot Scandal contributed to the rift between the conservative and progressive factions in the Republican Party. William Taft was the 27th American President who served in office from March 4, 1909 to March 4, 1913. One of the important events during his presidency was the Ballinger-Pinchot Scandal. President Roosevelt was a friend and originally a staunch supporter of his successor William Taft, who Roosevelt believed would continue his progressive domestic policies. A rift between the two men, and within the Republican party, immediately began to develop in the new administration as a result of the Payne-Aldrich Tariff Act which was passed on April 9, 1909. Then, in November 1909, the Ballinger-Pinchot Scandal erupted, that would completely destroy Taft's reputation with the progressives in the Republican party for good. In 1907 Richard Ballinger had been appointed commissioner of the General Land Office by President Theodore Roosevelt. Ballinger was then made the Secretary of the Interior in President Taft's administration, replacing James A. Garfield, an ardent member of the Conservation Movement. Gifford Pinchot was the head of the forestry division in the Department of Agriculture in Taft's administration. Pinchot was a passionate environmentalist who had been instrumental in the national campaign for conservation. Louis Glavis (1883–1971) worked in the United States Department of the Interior and was an agent of the Department's General Land Office's Field Division. The conservationist Louis Glavis was also a lawyer and believed that land deals being made in Alaska were illegal and that companies were exploiting vast tracts of public domain land, which included lucrative Alaskan coal fields, for private development. The Ballinger-Pinchot Scandal broke when Louis Glavis informed Gifford Pinchot of the Alaskan land deals. Ballinger had made nearly one million acres of Alaskan public forests and coal fields open to private development. Pinchot took the complaints to the President but Taft and the Attorney General believed they were groundless. Pinchot disagreed and leaked the matter to the press. The American magazine Colliers Weekly investigated the allegations and accused Ballinger of improperly using his position for personal profit by helping industrialists illegally gain access to Alaskan coal fields. Gifford Pinchot openly criticized both Ballinger and President Taft for their 'shady dealings' and called for Congress to investigate further. 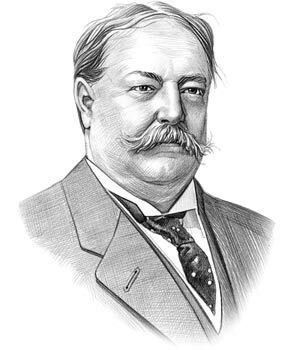 President Taft was furious with Pinchot Gifford and fired him, and his informant, Louis Glavis, for insubordination. The Congressional committee decided the charges were unjustified and cleared Ballinger. The Ballinger-Pinchot Scandal aroused unwanted speculation and scandal in the press about the Taft administration. The rift in the Republican party became permanent. The Progressives, including Roosevelt, believed that President Taft had betrayed the ethics of conservation. Roosevelt would go on to challenge to Taft in the 1912 presidential elections founding the Progressive Republican Party and ran on the independent 'Bull Moose' ticket. The split in the Republican party resulted in the election of Woodrow Wilson and the Democratic party. The article on the Ballinger-Pinchot Scandal provides detailed facts and a summary of one of the important events during his presidential term in office. The following William Taft video will give you additional important facts and dates about the political events experienced by the 27th American President whose presidency spanned from March 4, 1909 to March 4, 1913.